Psychoanalytic Perspectives on Virtual Intimacy and Communication in Film brings together a group of psychoanalysts to explore, through film, the new forms of communication, mainly the internet, that enter more and more frequently into the affective lives of people, their intimacy and even the analytic room. The contributors, all practising psychoanalysts, analyse the potential and surprising transformations that human relationships, including psychoanalysis, are undergoing. At present, it is difficult to value the future importance and predict the possible disquieting consequences of the use and abuse of the new technologies; we run the risk of finding ourselves unprepared to face this revolutionary transformation in human connections and affects. Will it be possible in a near future that human beings prefer to fall in love with a machine gifted with a persuasive voice instead of a psychoanalyst 'in person'? The contributors explore the idea that virtual intimacy could begin to replace real life, in sentimental and psychoanalytic relationships. Imagination and fantasy may be strengthened and may ultimately prevail over the body, excluding it entirely. Can the voice of the analyst, sometimes transmitted only by telephone or computer, produce a good enough analytic process as if it were in-person, or will it help to foster a process of idealisation and progressive alienation from real life and connections with other human beings? The film Her (2013), alongside others, offers a wonderful script for discussing this matter, because of the deep and thoughtful examination of love and relationships in the contemporary world that it provides. 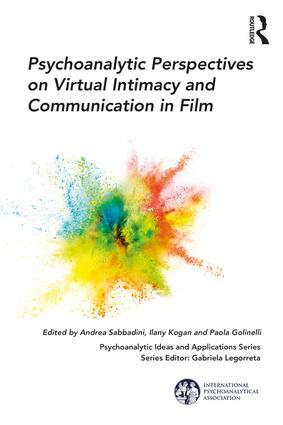 Psychoanalytic Perspectives on Virtual Intimacy and Communication in Film will be of great interest to all psychoanalysts and psychoanalytic psychotherapists interested in the ongoing impact of technology on human relationships. Andrea Sabbadini is a Fellow of the British Psychoanalytical Society who works as a psychoanalyst in private practice in London. He is also a former Trustee of theFreud Museum, a Lecturer at UCL, a Consultant to the IPA Committee on Psychoanalysis and Culture, and the director of the European Psychoanalytic Film Festival. He has written many articles, is the editor of several books, and the author of Boundaries and Bridges: Perspectives on Time and Space in Psychoanalysis (Karnac, 2014) and Moving Images: Psychoanalytic Reflections on Film (Routledge, 2014). Ilany Kogan is a Training Analyst at the Israel Psychoanalytic Society. She works as a teacher and supervisor at the Generatia Center, Bucharest, Romania, and in Germany, including Munich and Aachen. For many years, she worked extensively with Holocaust survivors’ offspring, and has published papers and books on this topic. She was awarded the Elise M. Hayman Award for the Study of the Holocaust and Genocide (2005). She received the Sigourney Award 2016.